Back in April 2014 as part of the minimum criteria testing I was doing, I observed that the percentage of public company filings which conformed to all of the fundamental accounting concept relations was 25.6% (1711 filers). Last month I pointed out that the percentage of public companies which conformed to all of these relations was 53.1% (3863 filers). 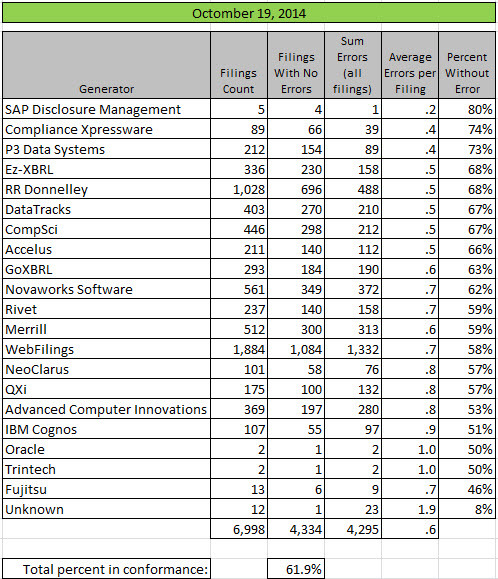 I ran the same test for the last filing of every public company which reports to the SEC today and the percentage that conform to all of the fundamental accounting concept relations is now at 61.9% (4334 filers). You can see the graphic below which breaks this information out by generator (filing agent or software used). These relations between fundamental accounting concept relations is not really controversial and it is increasingly easy to understand and correct the errors. I have provided a substantial amount of information here which helps those who want to correct these issues. This recently added analysis shows that each of these tests can precisely detect not only nonconformance to these relations, but also generally the reason for nonconformance. I know of at least one commercial implementation of software which can be used to detect and therefore correct these issues, XBRL Cloud. This testing will appear on XBRL Cloud's Edgar Dashboard at some point. If you look at the numbers below and compare them to the prior results you will see that pretty much every generator is improving. I pester software vendors to include this testing in their products to help them understand that their software can help external financial reporting managers avoid errors like these. But more importantly, I am trying to get software vendors to realize that this is only the tip of a much, much bigger iceberg. This is a digital disclosure checklist summary which I created several months ago. This shows you where things are headed. These rules may seem annoying to software vendors. I can tell you two things. First, external financial reporting managers already have to comply with these rules. They are just doing so using time consuming and expensive manual processes. Second, automate these tasks by leveraging the XBRL-based structured information and you will provide something very useful: reducing the risk of noncompliance. It is these rules which will make the quality of public company financial information submitted to the SEC to be at a level to make it safely, reliably, predictably usable by machine-based automated processes. If you don't understand digital financial reporting, the risk of becoming a relic of the past is increasing every day. (Click image for larger view)If you don't want to become a relic of the past era of paper-based financial reporting, understand how digital financial reporting really works. Digital financial reporting is not only inevitable, it is imminent. If you want to understand the moving parts and you can walk through an Excel macro, the prototype Excel application on a link at the bottom of this page can help you understand the important moving pieces. Digital is not software, it is a mindset!